I am pleased to submit the 2001 Annual Report of the Assembly Standing Committee on Real Property Taxation. This was a busy year for the Committee, with a wide range of challenging issues and legislation considered. This year, as was the case last year, one of the focuses of the Committee continued to be School Tax Relief (STAR) review and improvements. The Committee reported legislation to the Assembly floor for the 4th annual Assembly STAR day on March 21st, 2001. In all, 11 STAR improvement bills passed the Assembly and two became chapters. The Committee resolved to continue the work of the Assembly STAR Task Force you appointed in 1998, and looks forward to increasing the ease of application and availability of this popular exemption program. Two other important and complex issues the Committee tackled this year were assessment administration reform and local exemption of nuclear power plants. While one particular bill addressing the issue of nuclear power plants was signed into law, the Committee will continue discussion on these issues during the coming 2002 session. Of course, the committee will also review the two World Trade Center relief bills you introduced immediately after the terrorist attacks, and we look forward to working with you to alleviate the suffering of the victims and that area of NY City in general. In addition, the Committee met thirteen times having acted on over 250 bills. It reviewed and reported proposed legislation in a variety of areas including general administration, exemption administration, tax collection and enforcement, and many bills of a local nature. The Committee also worked with ideas put forth by the Office of Real Property Services, and was closely involved in Budget negotiations particularly with regard to STAR proposals. I have greatly enjoyed working with the Real Property Tax committee members this year. Their knowledge and enthusiasm made my working with this Committee pleasant and productive, and they were also critical to the Committee's success. Three new laws were enacted this year relating to the School Tax Relief (STAR) exemption authorized by section 425 of the Real Property Tax Law. These laws address specific issues that have arisen as a result of local administration of this important state tax benefit for homeowners. As has been the case in the past, the Governor proposed a budget that contains provisions which revise the STAR program prospectively effective with applications for the 2001-02 school year, and is a direct result of recommendations made by the Assembly to ease administration of the program and ensure qualifying homeowners receive the exemption benefit. Chapters 233 and 555 authorize a taxpayer who is eligible for the enhanced STAR exemption to designate an adult third party to receive from the school district an annual notice regarding the application requirement. The taxpayer's request must be made on a form prescribed by the State Board, and must be submitted to the school district no later than 60 days before the first taxable status date to which it is to apply. When such a request has been filed, the designated third party must be sent a notice at least 30 days before each ensuing taxable status date, reading substantially as follows; "On behalf of (identify senior citizen or citizens), you are advised that his, her or their renewal application for the enhanced STAR exemption must be filed with the assessor no later than (enter) date. You are encouraged to remind him, her, or them of that fact, and to offer assistance if needed, although you are under no legal obligation to do so. Your cooperation and assistance are greatly appreciated." [A.6760-A, Schimminger; A.9427, Rules (Schimminger)]. Chapter 405 specifies the timing and procedure for crediting owners of manufactured homes (sometimes referred to as mobile homes) located in manufactured home parks with rental credits on account of real property tax exemptions granted to the manufactured homes. The reduction in monthly rent would normally be paid in 12 parts, beginning with the first monthly rental payment due 60 days after the penalty-free period for the payment of taxes and continuing for 11 months [Real Property Law, §233(w)]. In lieu of providing a monthly rent reduction, the park owner (operator or agent) has two options: (1) to credit the total reduction against the first month's rent, with any balance credited against the following month(s)' rent(s) until exhausted, or (2) to pay the total reduction to the manufactured home owner within 60 days of the interest-free collection period. (A.2989-A, Tokasz). In addition to the Assembly bill numbers mentioned above, there are a series of STAR initiatives that passed the Assembly this year. Special Situations - This bill provides for the application of the STAR exemption in cases of parcels with two or more separated residences, residences split by municipal boundaries, and mixed-use property in certain assessing units. (A.39, Cahill). Farm Dwellings - This bill makes provisions with respect to eligibility of farm dwellings held by a corporation or partnership provided the dwelling serves as the primary residence of the partner or shareholder. (A.865, Magee). Proof of Age - This bill sets forth the documentation acceptable to establish proof of age for application to the enhanced STAR exemption. (A.1506, Colman). Hardship - This bill provides extension of applications for homeowners who fail to meet a STAR deadline because of a death or illness in the family, or other extenuating circumstances. (A.1768-A, Christensen). Reapplication for Enhanced STAR - This bill sets forth criteria for senior citizens to continue to receive the enhanced STAR exemption through a "statement of continued eligibility" and provides for giving notice thereof. It also authorizes the Department of Tax and Finance to provide verification of income. (A.2425, Morelle). Receipt for Applications - This bill requires local assessors to provide a receipt upon request to applicants who submit a STAR application. The assessor is also required to send a receipt when the request is made other than in person and the applicant has provided a self-addressed stamped envelop. (A.2503, Morelle). Notification of STAR- This bill requires school districts to give property owners annual notice of the availability of the STAR exemption and modifies the text of the notice. (A.4351, Higgins). Retrospective Application - This bill provides for a retrospective application for STAR where a person purchases property after the applicable taxable status date. (A.4352, Higgins). Additional Entities - This bill extends the STAR program to additional entities; provides that in cases where a cooperative corporation is incorporated pursuant to the private housing finance law, and where the real property of such corporation is totally exempt from local and municipal real property taxes for any fiscal year, a reduction in the portion of shelter rent payments or payments in lieu of taxes to be made to a municipality shall be provided. (A.7142, Silver). Cost of Living Adjustment - This bill provides for a cost of living increase in the income standard for eligibility for the enhanced STAR exemption commencing with the 2002-2003 school year. (A.7539-A, Eddington). Chapter 529 authorizes municipalities to offer, at local option, a partial exemption for newly constructed homes purchased by "first-time homebuyers" (RPTL, §457). For this purpose, a "first-time homebuyers" is any person who has not owned -- and whose spouse has not owned -- a home during the previous three years, and who does not own a vacation or investment home. The exemption does not generally apply to purchases of existing homes. However, if a first-time homebuyer purchases and renovates or remodels an existing home, any increase in assessed value due to the renovation or remodeling would be eligible for the exemption, as long as the cost exceeded $3,000 and the contract for the work was executed within 90 days from the date of purchase. (A.5992, Sweeney). Chapter 427 extends until December 31, 2003 the date by which construction for certain new multiple dwellings in the City of New York must begin in order to qualify for exemption (RPTL §421-a). Under prior law, those dwellings had to be completed by December 31, 2003 in order to qualify for the exemption. (A.9040, Rivera, P). Chapter 319 makes a technical amendment to a recent enactment which allows a county with a population of between 133,000 and 141,000 inhabitants, and the towns and villages therein, to provide a partial exemption for members of volunteer fire companies, fire departments and incorporated volunteer ambulance services (RPTL, §466-b, as added by l.2000, c.609). The amendment extends this option to the cities within such a county as well. The only county which currently falls within the specific population bracket is Chautauqua County, which contains two cities. (A.7545, Parment). Chapter 411 expands the Agriculture Buildings exemption (RPTL, §483) to encompass structures and buildings used for the "breeding and boarding of livestock, including commercial horse boarding operations." previously, property was eligible for the exemption if it was used to breed horses, but not if it was used primarily to board horses, or to breed and/or board other livestock. since the statute requires an agricultural nexus between the buildings and the land, a non-farmer who boards animals would not qualify for the exemption. (A.4621, Magee). Chapter 530 promotes more current and equitable property tax assessments, by extending the duration of the levels of State aid payable under the annual reassessment aid and maintenance aid programs, and by providing counties with State aid for providing certain types of assistance to assessing units. The annual reassessment program [RPTL §1573(2)] originally authorized state aid of up to $5 per parcel on each assessment roll through 2004, and up to $2 per parcel on each assessment roll thereafter, for assessing units which satisfied the applicable criteria. To encourage the fullest possible participation in this program, the new law (1) extends the $5 payment to apply to each qualifying assessment roll completed during an assessing unit's first five years in the program and (2) increases the maximum annual payment thereafter to $3 per parcel. The authorization for these payments is scheduled to sunset after the completion of 2009 assessment rolls. The legislation also extends until 2004 the authorization for payments of up to $2 per parcel for assessing units which continue to satisfy the requirements of the pre-existing maintenance aid program, provided that they applied for aid in either 1999 or 2000. Under prior law, the authorization for this payment was to expire after 2000. Finally, the legislation authorizes a one-time payment of aid of up to $1 per parcel to counties which enter into agreements with assessing units pursuant to §1537 of the RPTL to provide exemption services, appraisal services or assessment services to the assessing unit. [A.8408-A, Rules (Christensen)]. Chapter 87 authorizes a temporary local-option real property tax exemption for nuclear power plants (RPTL, §485). The option may only be exercised by local law or resolution adopted after conducting a public hearing. Each level of local government - i.e., the county, town and school district - is empowered to decide whether to offer the exemption for its own purposes. Thus, for example, if the county opts to offer the exemption but the town and school district do not, the plant would be exempt from county taxes but subject to town and school district taxes. In a locality that chooses to offer the exemption, a nuclear power plant will remain exempt until 2016, unless the locality provides for an earlier termination. During the term of the exemption, the owner or owners of the facility must make payments in lieu of taxes (PILOTs). If the parties cannot negotiate a mutually satisfactory PILOT arrangement, a compulsory PILOT will be imposed pursuant to a statutory formula that essentially equates to the taxes that would have been paid if the plant had been taxable. Assessment disputes may be reviewed in the usual manner though the plant is wholly exempt from taxation; any court-ordered reduction would result in an appropriate reduction in the PILOT obligation. A nuclear power plant which is exempt for all purposes will not be considered when calculating the `regular' State equalization rate. If the plant is exempt for school district and/or county purposes - but not all purposes - and the `regular' rate would result in a tax shift of at least two percent, the State Board must establish a "special apportionment rate" to be used to apportion school district and/or county taxes, as the case may be. The State Board may establish "full value adjustments" at the request of an affected county or school district to phase in over a five year period any apportionment impact resulting from the special apportionment rate. (A.6639, Galef). Chapter 515 requires real property that is owned or leased for "non-residential water dependent activities" to be assessed based upon its current use, rather than its highest and best use (RPTL §582-a). The structures covered by this new law include those that are (1) within a "marine district as provided in the coastal zone management local waterfront revitalization program" or a "state approved comprehensive harbor management plan" pursuant to the Executive Law; (2) located on lands leased from the State or the Thruway Authority for non-residential purposes considered to support water dependent activities; (3) used for the purpose of berthing and mooring of recreational vessels, and the storage thereof, or a boatyard, marine service facility, charter or sports fishing station, bait and fuel operations, marine towing; or (4) used for any other non-residential purpose that requires the use of waterfront lands in order to function or provide marine services. Since current use had already been the standard of assessment for purposes of real property taxation. This legislation essentially codifies pre-existing law, as interpreted by the courts, for this type of property. (A.7245, DiNapoli). Chapter 322 allows the State Board to adjust current special franchise assessments when the special franchise assessments for the preceding year were based upon incorrect physical inventories [RPTL §608(2)and (3)]. A separate assessment will be created when there was omitted property. A deduction will be taken from the current assessment when physical property was incorrectly included when valuing the special franchise for the preceding assessment roll. The legislation also allows a special franchise owner or assessing unit to submit material at a hearing when the other party is challenging a special franchise assessment [RPTL §610(3)]. [A.8410, Rules (Gunther)]. Chapter 367 extends by three years the effectiveness of local laws which various eligible villages adopted to continue enforcing delinquent taxes pursuant to former Title 3 of Article 14 of the RPTL, rather than Article 11. Prior to this enactment, such local laws only applied to taxes becoming liens from 1995 through 2000 (see, L.1994, c.532, §9; L.1998, c.466). Chapter 201 allows the Town of Tonawanda to apply some or all of certain payments in lieu of taxes (PILOTs) entirely to the credit of the non-homestead class, rather than to all property, when allocating taxes between the homestead and non-homestead classes [RPTL §1903 (4-a)]. The only PILOTs subject to this option are those payable by lessees of Industrial Development Agency property. This legislation remains in effect for three years from the date it became effective (August 20, 2001) and then is deemed repealed. (A.4693-A, Schimminger). Chapter 191 preserves the class tax shares that will exist when taxes are levied in most special districts in Nassau County on the 2001 assessment roll [RPTL, §§1803, 1803-a(8), 1803-b(1)(a)]. In the future, the class tax shares would be adjusted annually to keep pace with `physical changes' (e.g., new construction or demolition). The County may also make an annual five percent discretionary adjustment, as long as the adjustment is not inconsistent with any changes in the value of the class as indicated by the assessed value of the class and the most relevant class equalization rate. [A.9322-A, Rules (DiNapoli)]. Chapter 344 provides that for purposes of the New York City fiscal year ending in 2002, the current base proportion of any class may not exceed the adjusted base proportion of that class in the prior fiscal year by more than two percent [RPTL, §1803-a(k)]. Any excess over this limit is to be distributed to the other classes, as long as the distribution does not cause and other class to exceed its own two percent limit. Without this legislation, an increase of up to five percent would have been allowable. [A.9136, Rules (Carrozza)]. Chapter 294 extends for three years (through fiscal year ending in 2003) the temporary partial tax abatement program for residential cooperatives and condominiums in class 2 in New York City (RPTL, §467-a). Class 2 is basically comprised of residential structures of more than three units other than hotels or motels [RPTL, §1802(1)(b)]. The abatement is a tax reduction of 25% in structures with an average unit assessed value of $15,000 or less and 17.5% in structures with a greater average unit assessed value. [A.9182, Rules (Grannis)]. 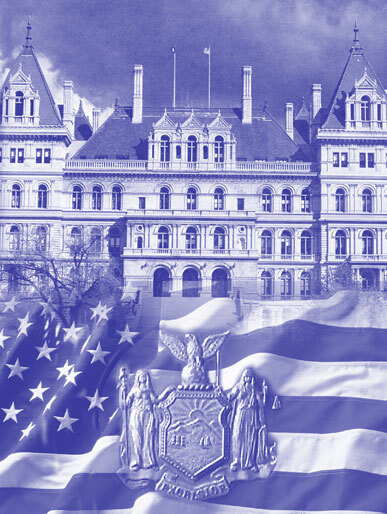 In Response to the tragedy suffered by New York City on September 11, 2001, the Assembly immediately introduced several bills in an attempt to alleviate the burden of the victims of the terrorist attack and their families. Two such bills are currently being considered in the Real Property Tax Committee and will continue to be reviewed during the 2002 legislative session. This bill would extend until January 2, 2002 the deadline for the payment of any real property tax, including installment payments, due during the period from September 11, 2001 through January 2, 2002 if the property is owned by victims of the hijacked airplanes (including those on the plane as well as those on the ground), by relief workers assisting in the disaster and by those whose property or employment was in the area of the terrorist attack on the World Trade Center. The State would provide aid to each municipal corporation to compensate it for the loss of income and interest resulting from the delayed real property tax payments. [A.9469, Rules (Silver)]. This bill allows localities to grant a fifteen percent exemption from real property taxation up to $12,000 of the assessed value of the residence. In addition, local municipalities will have the option to either decrease or increase the maximum allowable exemption to specified levels. This exemption would apply to county, city, town and village taxation but would not apply to school property taxes. [A.9470">A.9470, Rules (Silver)]. The Real Property Tax Committee will deal with many diverse and demanding issues in the 2002 Legislative Session. Initially, the Committee will be actively involved in the budget process as it pertains to Office of Real Property Services and real property tax administration. STAR Revisions: As has been the case in recent years, there are number of issues related to the administration of the STAR program which remain to be addressed. This includes the facilitation of the reapplication process for seniors; improved verification systems for enhanced applications; determination of qualifying properties; and clarification of refund policies, among others. NYC Multiple Dwellings: Another issue to be addressed is that of extending abatements and enacting assessment relief to Class two condos and cooperatives in New York City. Assessment Administration: It has come to the attention of the committee in recent years that there are serious problems with the assessment administration of certain counties in the State. One particular area is Suffolk county where one of the Committee members held a town meeting to hear the concerns of his constituents on this issue. The committee will look into these issues further and attempt to help these areas reach more equitable assessment practices. Not-for-Profit Exemption Reforms: This year the committee had to deal with another substantial number of individual retroactive not-for-profit exemptions that have become very controversial among the members of the committee. The Committee will be assessing alternative methods to retroactively confer this tax benefit on not-for-profit property owners without the need for individual legislation. Railroads: The 2000 legislative session brought to light the need to establish appropriate railroad assessment ceilings and methodology. This is an issue that impacts State transportation and property tax policy as well as affecting local revenues for 700 local governments. We worked on this issue during the 2001 session and remain hopeful that there will be resolution to this problem achieved during the 2002 session. Volunteer Firefighters and Ambulance Workers: There have been ongoing attempts to expand tax exemptions for volunteer firefighters and enacting similar exemptions for volunteer ambulance service workers. The committee has been evaluating all individual proposals and will continue to work on getting just one bill to address every area of concern. A.2989-A Tokasz 405 Provides for prompt payment or rental offset or STAR benefits to manufactured home owners. A.4041-A Sweeney 543 Authorizes the assessor of the town of Babylon to accept not-for-profit exemption application from Trinity Evangelical Lutheran Church. A.4042-A Sweeney 228 Authorizes the assessor of the town of Babylon to accept not-for-profit exemption application from the Shaw Temple Ame Zion Church. A.4618 Hooper 283 Authorizes the assessor of the town of Hempstead to accept not-for-profit exemption application from the Deliverance Revival Center, Inc.
A.4621 Magee 411 Adds definitions of certain farming activities to be included for purposes of qualifying for the farm structure and building exemption. A.4693-A Schimminger 201 Provides for allocation of payments received in lieu of taxes from lessees of IDA agency property in the town of Tonawanda. A.4948-A Levy 255	 Authorizes the assessor of the town of Islip to accept not-for-profit exemption application from Central Islip Church of Christ. A.5030 Hooper 325 Amends Chapter 293 of 1999 relating to not-for-profit exemption for the Church of the New Life, Inc.
A.5246-A Coleman 256 Authorizes the assessor of the town of Ramapo to accept not-for-profit exemption application from Beis Hamedrash Sharei Tefilah. A.5479 DiNapoli 367 Extends provision relating to the enforcement of the collection of taxes in certain villages until 2003. A.5690 DiNapoli 246 Authorizes the assessor of the county of Nassau to accept not-for-profit exemption application from Congregation Shira Chadasha. A.5691 DiNapoli 246 Corrects a reference to a section of law relating to the application for exemption by Chabad of Port Washington. A.5992 Sweeney 529 Permits localities to grant a real property tax exemption for first-time homebuyers of newly constructed or renovated homes. A.6061-A Sweeney 133 Authorizes the assessor of the town of Babylon to accept not-for-profit exemption application from the Faith Tabernacle church in Christ for All People, Inc.
A.6091-A Alfano 258 Authorizes the assessor of the town of Hempstead to accept not-for-profit exemption application from the Elmont fire district. A.6102 Murray 259 Authorizes the assessor of the town of Hempstead to accept not-for-profit exemption application from Bellmore-Merrick E.M.S. Inc.
A.6433 Levy 134 Amends Chapter 151 of 2000 in relation to not-for-profit exemption for Holy Church of Christ in the town of Islip. A.6484-A Boyle 262 Authorizes the assessor of the town of Babylon to accept not-for-profit exemption application from the West Babylon Church of God of Prophesy. A.6495 Sweeney 261 Authorizes the assessor of the town of Babylon to accept not-for-profit exemption application from the town of Babylon for a certain parcel acquired by the Town. A.6581 Barra 265 Authorizes the assessor of the town of Hempstead to accept not-for-profit exemption application from the Baldwin fire district. A.6639 Galef 87 Establishes the real property taxable status of nuclear powered electric generating facilities. A.6700-A Vitaliano 266 Authorizes the assessor of the borough of Staten Island to accept not-for-profit exemption application from The Gingerbread Learning Center. A.6760-A Schimminger 233 Provides for designation of an adult third party to receive notice regarding senior STAR exemption; protects eligible seniors from losing such exemption due to infirmity which might cause difficulty in making timely response to such notice. A.6883-A DiNapoli 274 Authorizes the assessor of the town of North Hempstead to accept not-for-profit exemption application from the Zion Baptist Church. A.7205-A Hooper 326 Amends Chapter 331 of 2000 in relation to not-for-profit exemption for the Miracle Christian Center, Inc. in the village of Hempstead. A.7245 DiNapoli 515 Limits and reduces real property tax assessments for the value of lands supporting non-residential water dependent activities. A.7275 O'Connell 257 Authorizes the assessor of the town of North Hempstead to accept not-for-profit exemption application from the New hyde Park fire district. A.7521 Flanagan 278 Authorizes the assessor of the town of Huntington to accept not-for-profit exemption application from Mesorah Foundation of Long Island, Inc.
A.7545 Parment 319 Provides that the 10% real property tax exemption granted to volunteer firefighters and ambulance workers residing in counties with a population of between 133,001 and 140,999 shall apply to taxes levied by a city. A.7666 Ferrara 561 Authorizes the assessor of the town of North Hempstead to accept not-for-profit exemption application from Chabad Lubavitch of Old Westbury. A.8408-A Rules (Christense) 530 Extends the duration of the levels of state aid currently payable under the annual reassessment aid program and provides state assistance for improved real property tax administration. A.8410 Rules (Gunther) 322 Provides for the establishment of special franchise assessments and the appearance of the non-complaining witness at a hearing thereon. A.8411 Rules (Gromack) 421 Removes barriers to the creation of coordinated assessment programs; empowers a county director to perform data collection, sales verification, or other assessment-related services. A.8434 Rules (Barra) 279 Authorizes the assessor of the town of Hempstead to accept not-for-profit exemption application from the village of Valley Stream. A.8484-B Rules (Millman) 90 Authorizes the assessor of the borough of Brooklyn to accept not-for-profit exemption application from St. Ann's school. A.8815-A Rules (Alfano) 286 Authorizes the assessor of the town of Hempstead to accept not-for-profit exemption application from St. Basil Orthodox Church. A.8825 Rules (Ortiz) 332 Authorizes the assessor of the borough of Brooklyn to accept not-for-profit exemption application from the Brooklyn Cultural Center of NY, Inc.
A.8891-A Rules (Eddington) 287 Authorizes the assessor of the town of Brookhaven and the village of Patchogue to accept not-for-profit exemption application from the Suffolk County Sports Hall of Fame. A.8902-A Rules (Heastie) 219 Authorizes the assessor of the town of the borough of the Bronx to accept not-for-profit exemption application from the Bronx Arya Samaj, Inc.
A.9024 Rules (Sweeney) 289 Authorizes the assessor of the town of Babylon to accept not-for-profit exemption application from the First Methodist church. A.9040 Rules (Rivera,P) 427 Provides that certain new multiple dwellings in the city of New York shall be exempt from real property taxes if construction is commenced before December 31, 2003. A.9136 Rules (Carrozza) 344 Caps the market value adjustment for class shares for fiscal year 2002 at 2% rather than 5% for real property assessments. A.9160 Rules (Weisenberg) 577 Authorizes the assessor of the town of Hempstead to accept not-for-profit exemption application from Chabad of Five Towns. A.9182 Rules (Grannis) 294 Extends for three years partial abatement of real property taxes on residential real property held in cooperative or condominium form of ownership in NYC. A.9186 Rules (Rivera, P.) 293 Authorizes the assessor of the borough of the Bronx to accept not-for-profit exemption application from The New York Public Library, Astor, Lenos and Tilden Foundations. A.9322-A Rules (DiNapoli) 191 Provides for the allocation of real property taxes in town and county special districts within special assessing units. A.9427 Rules (Schimminger) 555 Amendment to Chapter 233 of 2001 in relation to third party notifications for Enhanced STAR-eligible seniors. A.39 Cahill Provides for the application of the STAR exemption in cases of parcels with two or more separate residences, residences split by municipal boundaries, and mixed-use property in certain assessing units. A.509 Destito Authorizes localities to use the federal definition of income for determining eligibility for the senior enhanced STAR. A.863 Magee Makes provisions with respect to service of real property assessment challenges upon fire districts. A.865 Magee Makes provisions with respect to eligibility of farm dwellings for the STAR exemption. A.1506 Colman Sets forth the documentation acceptable to establish proof of age for the enhanced STAR exemption. A.1530 Matusow Authorizes the assessor to accept a not-for-profit exemption application from the Pound Ridge Land Conservancy, Inc.
A.1768-A Christensen Authorizes tax assessor to approve or deny applications for STAR exemptions where failure to apply on time resulted from a hardship. A.2130-A Morelle Authorizes counties to establish their own rate of interest on real property taxes paid in installments. A.2399 Weisenberg Provides for applicability of STAR exemption where owner is absent from the property while receiving health-related care. A.2425 Morelle Sets forth criteria for seniors to continue to receive the enhanced STAR exemption; authorizes the Department of Tax and Finance to provide verification of income. A.2503 Morelle Provides for the issuance by an assessor of a receipt for the submission of an enhanced STAR application; requires applicant to provide a self addressed stamped envelope when the request of the receipt is made other than in person. A.2727 Weisenberg Conditions receipt of business investment real property tax exemptions on use of local labor sources for construction, alteration, installation or improvement; defines the term local labor. A.3538-B Hooper Authorizes the assessor to accept a not-for-profit exemption application from the First church of God in Christ, Inc.
A.3672-B Perry Authorizes the assessor to accept a not-for-profit exemption application from Sesame Flyers International, Inc.
A.4351 Higgins Requires school districts to give property owners annual notice of the availability of the STAR exemption and modifies the text of the notice. A.4352 Higgins Provides for a retrospective STAR application where the applicant purchases property after the taxable status date. A.4955 Sweeney Authorizes the assessor to accept a not-for-profit exemption application from the Amityville Housing Rehabilitation Association, Inc. to retroactively apply for exemption. A.5942 Pretlow Authorizes the assessor to accept a not-for-profit exemption application from Grace Baptist Church. A.6739 Grannis Relates to partial abatement of real property taxes on real property in class two held in cooperative or condominium form; extends the time in which NY City must report to the legislature on the disparity between class one and two to 2002. A.7128-B Pretlow Authorizes the assessor to accept a not-for-profit exemption application from Bethel Temple, Inc.
A.7142 Silver Extends the STAR exemption to certain additional entities and make these provisions retroactive to the 1999-2000 school year. A.7264 Koon Permits any municipality which converts to full value assessments to raise maximum exemption amounts to keep the tax amount saved the same after conversion. A.7289-A Sweeney Authorizes the assessor to accept a not-for-profit exemption application from the Faith Temple Church of God in Christ. A.7539-A Eddington Provides for a cost of living increase in the income standard for eligibility for the enhanced STAR exemption. A.7589-A Abbate Provides nonprofit organizations real property tax exemption, at local option, for those promptly applying after the municipality's taxable status date. A.8968 Rules (Tokasz) Provides that surplus funds for purposes of school district tax levies are those in excess of a 3% threshold and dedicates certain funds to special education. A.9184 Rules (Grannis) Extends for three years partial abatement of real property taxes on residential real property held in cooperative or condominium forms of ownership in NY City. A.9426 Rules (Hooper) Authorizes the assessor to accept a not-for-profit exemption application from the Deliverance Revival Center, Inc.